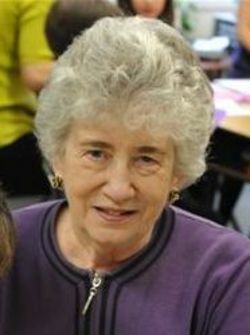 Jacquelyn Marie Lefebvre (Jackie), age 81, died Sunday, June 17, 2018 at Spring Hills Senior Community, Somerset, New Jersey after a lengthy battle with Alzheimer’s disease. Jackie was born to the late John (Jack) and Mary Grover in Highland Park. She married her beloved husband, Romeo on April 26, 1957 in Texas while Romeo was serving in the US Army. They bought a home in Piscataway and later in East Brunswick where they raised their three children. They then retired to Toms River. Jackie is survived by her children Diane Pavicic, Kenneth (Kenny) Lefebvre, and Lawrence (Larry) Lefebvre, and by her three sisters, Eileen Salvi, Barbara Allen, and Frances Liteplo and three brothers, William Grover, Robert Grover, and James Grover. She was the loving grandmother to eight grandchildren, Peri Elise, Michael, Adam, Kenneth Jr., Christopher, James, Patrick and Phoebe. She is proceeded in death by her brother John (Buddy) Grover and her parents, John and Mary. Funeral Services will be held at 10:00 am Wednesday June 27th at the Jaqui-Kuhn Funeral Home, 17 South Adelaide Avenue, Highland Park. Interment will follow at Holy Cross Cemetery, 840 Cranbury-South River Road, Jamesburg, N.J. (South Brunswick). The family invites you to join them at Lago Restaurant & Banquet Hall, 230 Washington Place, North Brunswick, N.J. directly afterwards for a light luncheon. Relatives and friends may call from 5:00 to 9:00 on Tuesday the 26th at the funeral home. In lieu of flowers, memorial contributions may be made to Alzheimer’s New Jersey, 425 Eagle Rock Road, Suite 203, Roseland, N.J. 07068.